State Senator Ed Buttrey (R-Great Falls) speaks at the announcement, as Governor Steve Bullock and Holly Blouch of Kalispell look on. Monday, Montana officially became the 30th state in the nation to expand its Medicaid program under the Affordable Care Act, commonly known as ObamaCare. The announcement at the state capitol was part news conference, and part pep rally, as Governor Steve Bullock thanked a crowd of supporters for everything they had to endure, including months of legislative maneuvering. 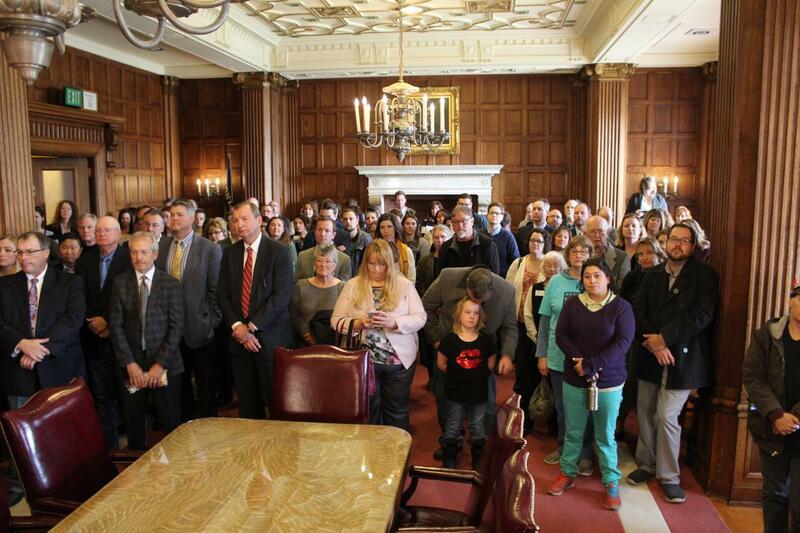 Supporters of Medicaid expansion were invited to the Governor's office for the announcement. Montana’s plan calls for some recipients to pay a token premium that still might pose a challenge for some living just above the poverty level. It also asks participants to take part in a job skills survey. Both of those features were the subject of intense negotiations between the state and federal governments. The state expects about 45,000 of the estimated 70,000 eligible low-income people to sign up. For many, it will just mean having access to check-ups and other wellness care, but for a few it could literally be a lifesaver. Holly Blouch of Kalispell says Medicaid expansion will make it possible for her to get on dialysis, and eventually get a kidney transplant. The announcement that the Federal Department of Health and Human Services had approved Montana’s request for a waiver came Monday morning, in time for people to start applying for the new Medicaid benefits which take effect on January first. Blue Cross-Blue Shield won the contract to administer the program back in September. Spokesman John Doran says much of the infrastructure work has been underway since then. Now that the waiver is in place, BCBS will turn to outreach, Doran says. The official portal to the expanded Medicaid program will be the same Healthcare.gov site used by people around the country, although the state has set up a page that explains the Montana program in detail. U.S. Health and Human Services Secretary Sylvia Burwell issued this statement earlier today, we'll have more on what it means for Montana in tonight's Montana News at 5:44 p.m., and throughout All Things Considered tonight. Montana’s legislature said yes to Medicaid expansion this spring, but the state’s expansion plan still needs approval by the federal government. Today, the state made the details of its expansion plan public, and is giving the public 60 days to comment on the plan before sending it to the White House. Backers of Medicaid expansion celebrated in Helena today as Governor Bullock signed the bill extending the health coverage to an estimated 45,000 more Montanans.